I am SUPER excited about this post today! I mean I'm usually pretty excited about giveaways, but this one is extra special. You may have noticed a certain blogger that has been showing up a lot on this blog lately. If not, that's ok, we forgive you, just try to pay attention. Becca Fowler, from Pivot Book Reviews has been graciously helping out with reviewing through the "Review my Books" program for a couple of months now. Her reviews have been completely awesome, and she's quickly become a favorite here on the blog. What you may not know, is that Becca is also an artist. Why do we care about that? Well, my dear friends, I will tell you. Becca has been using her artistic talents to create book tote art!! She started small, but has quickly become quite a hit with the bookies. The ones who like books, not the ones who take your money and beat you up. She has an ETSY shop where you can order pre-made totes, or get one custom made! So. Many. Options. 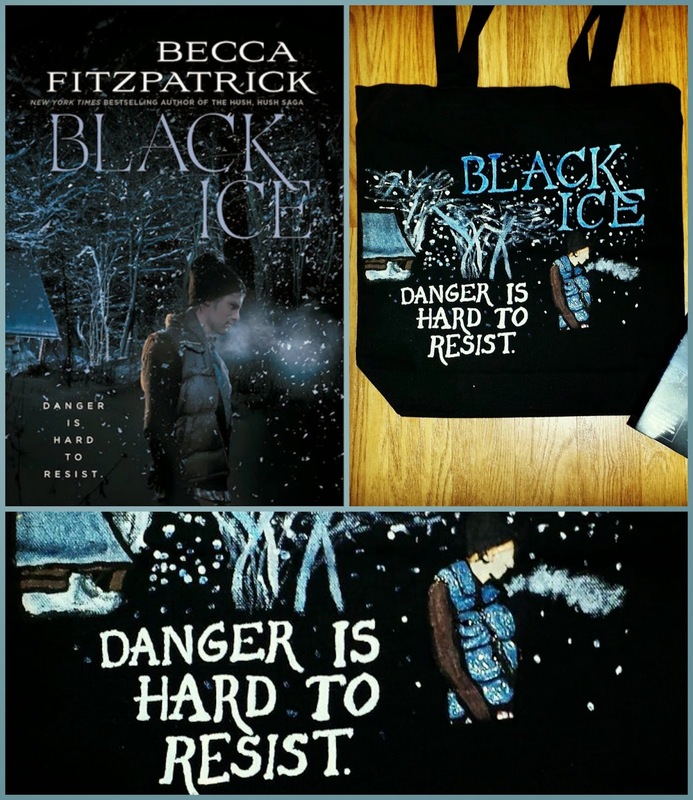 But today we're focusing on BLACK ICE by Becca Fitzpatrick. Becca, our Becca, not the author, Becca, has graciously made us a tote based off the book to give to one of YOU. Now Becca, our Becca, swears that she loves this book, and that it's not just because she's name-twins with the author. But, there's really only one way to know whether or not she's lying, and that's to read the book for yourself. So, along with the tote she's giving away, I'm throwing in an ARC of BLACK ICE. You're welcome, you can send eCards to andye @readingteen.net. Sadly this giveaway must remain US only, for obvious reasons. This pains me greatly, and I know all you International lovlies are shaking your fist at the sky or at me and yelling "WHY??!!" into the void, but we are lowly bloggers and just don't have the money to ship. Make sure you check out our other giveaways which are mostly International! There, are we friends again? Here's the lovely Rafflecopter! Good luck, and may the odds be ever in your favor! Oh wait, wrong book. Well, you get my point . . .
That tote is incredible! The detail is absolutely stunning. Definitely one of Becca's best yet! Thank you! This books sounds so good. The bag is awesome. I've checked out her etsy, and I'm thinking bout buying or requesting a custom order. She's so lovely, I've talked to her in Twitter!